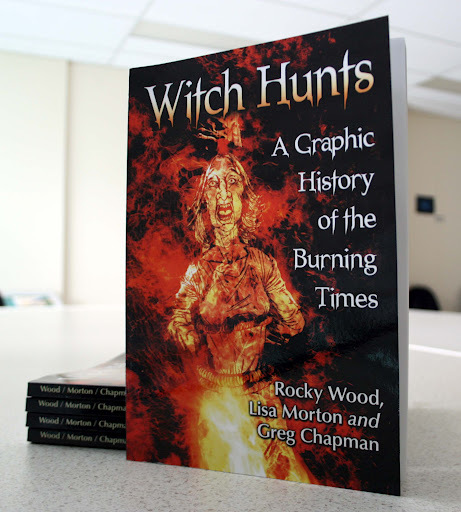 Just an hour ago I received some author copies of the graphic novel Witch Hunts: A Graphic History of the Burning Times. It was a very welcome surprise as the book wasn’t supposed to have been printed until next week, but given that Rocky, Lisa and I worked quickly with the proofing, it’s fantastic that our publishers McFarland printed the book ahead of schedule. To hold the finished product in my hands makes the 9-10 months to illustrate the tome so worthwhile. I may be biased here, but I think the graphic novel looks superb. This is an important volume; a chronology of one of the darkest periods in human history – a story that needs to be told and the authors Rocky Wood and Lisa Morton have done that very well. Hard to believe that this all started in October 2010 with an email from Rocky, who was at the time, a complete stranger. I hope he and Lisa are as proud as I am of what we have created here. If you wish to purchase a copy, they are available direct from the publisher HERE. The graphic novel is currently only available for pre-order from places like Amazon. Don’t forget about our website HERE and our Facebook page and for those about to read the graphic novel, thank you and I hope you enjoy it. It has been an honor working with you Greg. You added enormously to my vision and Lisa's with your perceptive, well researched illustrations. I'd say on every page our story was enhanced by you work. As a fellow writer you clearly understood the value of the narrative. And you work ethic impressed even me! Hey Greg, will it be available at NatCon next week?